Tiger Angel garments are manufactured from extremely comfortable and breathable materials. 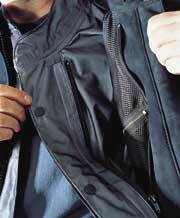 Only the finest full grain leathers and fabrics such as GORE-TEX®are used. To complement these superb materials we have chosen the very best lining fabric available. Sport-X is a high-performance fabric that can help the comfort of the people who wear it. The fibres move sweat away from the body to the outer layer of the fabric, where it dries faster than any other fabric. Sweat saps your strength. Better evaporation means you spend less energy to cool your body, which increases your performance and endurance. And because Sport-X has better breathability, nothing's more comfortable to wear. The mesh weave also allows very good airflow to help promote convective cooling in summer heat. The fibres in the Sport-X fabric speed moisture to the outer surface and air in to keep you cool and dry. The Sport_X fibres pulling moisture away from your skin.